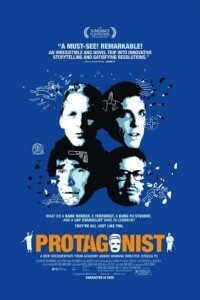 “Protagonist” explores extremism through contrasting stories of personal revelation. The film features four individuals who have been devoted to personal odysseys – a cause, a quest, an ideal – to the point of total consumption. At first glance the characters appear disconnected: a former German terrorist, an “ex-gay” evangelist, a bank robber and a martial arts student. But as their stories unfold, one starts to see the parallels between the uncommon, common experience of these four men. Each character embarks on a journey for valid reasons, only to find himself so deeply embedded in the cause that he becomes the opposite of what he had intended. He is blind to this fact, though, until the forces of fate and character boil and distill to a single moment of dark epiphany. In telling this echoing story, the film asks: what is the path to extremism? In responding to the turmoil of life, where does one draw the line between the reasonable and the unreasonable? And how does one recover from the delusion of certainty? The four stories in “Protagonist” are told in parallel threads and structured like a multi-layered Greek drama. Directed by Jessica Yu and produced by Yu, Elise Pearlstein and Susan West, this adventurous documentary is inspired by the works of the 5th century playwright Euripides. The film uses quotes from his plays as thematic chapter headings, providing a provocative common link between our contemporary stories and lending them a timeless quality. Wooden rod puppets, modeled after ancient Greek theater masks and designed by Janie Geiser, stage both the play excerpts and scenes from our subjects’ pasts. The film also features intricate title animation by Robert Conner, music by Jeff Beal and voiceover performance in ancient Greek by Marina Sirtis and Chris Diamantopolous.